Newark's romance with the automobile goes back more than 100 years, to the time when the automobile first appeared on city streets. As in other American cities, the new invention changed our entire outlook on life: the way we do business, go to work and play in our free time. It has, in fact, changed our local society as much as any other single influence in the 20th century. In the early days, the car was considered a fad or phase, but as it continued to be incorporated into society, change became evident. Streets were crowded with horseless carriages, and they added to the already growing congestion of wagons and horses. The city's first master plan was soon concerned about the creation of additional roads and the 'diamond in the cross' system for rerouting downtown street traffic. Additional police were needed to direct traffic, parking facilities were obviously necessary, and rules and regulations and court procedures were needed to handle new traffic problems. A car was now a social statement as well as a vehicle. Almost half the companies were credited with building a Newark car and actually produced a prototype which could be exhibited at the Newark or New York automobile shows. The Standard Catalog listed the following companies in Newark: Backus, Battin Steam, Blevney Steamer, Brunswick, C.T.M. Cope, Devac, Electrette, Elite Junior, Fergus, Flexible, Foley, Gibbs, Gillingham, Greene, Hoagland-Thayer, Hubers, Hygrade, Ignation, Joo, Kent, Keromotor, Lescina, Linkrouns, Livesey, Ludwig, Mackay, Mason Tourist King, Messerer, Murray, Newark, Nicol-winckelhofer, Nuse, Ofeldt Stem, Omar, Ostler and Zanes, Phianna, Quick, Quinby, Roseville, Seitz, T.C.M. Titus, Vogt-Electric, Vroom, W.S. and Wyckoff Steam. The following companies deserve more of our attention. The Fergus was built between 1916 and 1920 and is referred to as the 'Irish Car.' It was exhibited at both the New York and Newark automobile shows and had 4 cylinders and a completely automatic chassis lubrication system. It was built by J.B. Ferguson of Belfast, but the company later relocated and reorganized in the United States with headquarters in New York City and factory in Newark. World War I interrupted production. When the car was again put into production by 1920, the purchase price had risen from $7,500 to $9,000, a fact which led to its demise. The Kent Motor Corp., which was a fraud and not a manufacturer, was located just across the Newark/Belleville line. Its officers were indicted in a major stock swindle. Frederick H. Clarke, president of Kent Motors, was fined $2,500 and sentenced to three years in prison. His elderly father was also fined, as were other company officers. Clarke advertised the company as capable of producing large numbers of cars for the domestic and foreign market. In his advertising, he claimed in writing and pictures that his factory had great chimneys 'which belched forth clouds of smoke. Trains hauling away the finished product and other freight trains bringing in raw materials' (for factory consumption). According to another report, Kent Motor Co. was to undertake the export of cars to Latin America, where another factory was planned for Havana, Cuba. The auto itself was to include a 4 cylinder continental engine and the interior was to have a robe carrier foot-locker, an 8-day clock and other amenities of fine touring cars. After a visit to the presumed 16-acre Passaic River manufacturing site, officials were indicted by a federal grand jury for stock fraud, and a conviction was handed down by the courts that year. The Lescina was produced in 1916 and was to have 10 models. It was built in Chicago and was to be assembled in Newark. Although it was designed to have national distribution, it, too, failed in 1916. The Phianna Motor Company was named for twin daughters Phyllis and Anna from a Reading, Pa., family. The factory and assets were purchased by R.J. Metzler, T.M. Pepperday and John A. Bell who moved to Newark and began production. The Phianna was a small 4 cylinder with a 25 horsepower engine and a wheel base of 115.5 inches. Its purchase price was $3,600. It had an oval radiator and was a well-built automobile, which unfortunately did not sell well in America. Within a few years the company was acquired by the Wright-Martin Aircraft Corp. and eventually moved to Long Island. The Quinby was built 'when one of the oldest carriage building firms in the country, noted for more than a half century for excellence embarked on the manufacture of the electric carriage.' It later built machines for order only, and many of its products were exported. For awhile it was planning to expand as a car maker, but the stock company with an investment of more than $2 million did not succeed. By 1917, Quinby retired after 80 years of leadership in business. 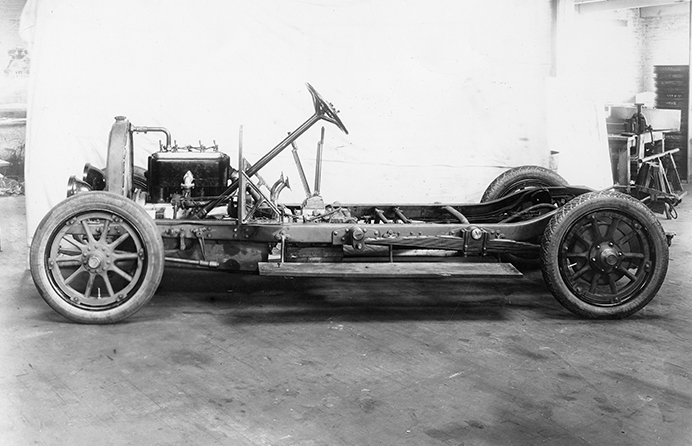 In 1904, the Simplex, also manufactured in Newark, was the first car made of an all-metal body. Its motor was a copy of a German-type machine that John J. Tuttle designed after spending hours of research in the local library 'poring over books and diagrams.' One of its first purchasers was Wallace M. Scudder, founder of the Newark News, who lived at that time in Forest Hill. In later years, a Simplex was found in Louisiana where it was being used to haul sugar cane from plantation to mill, and on the west coast, where one was used on the MGM movie lot. One Simplex was known to have run more than 700,000 miles – certainly a mark of durability. These stories of Newark-made cars are evidence of some considerable involvement in car making. Perhaps Newark's greatest contribution to the auto industry the making of parts used by larger companies located outside the state. With the thousands of products made in hundreds of Newark factories, it seemed only natural that some would be in demand by the national auto industry. Remembering that Newark's first industry was leather making, it was only natural that the making of leather interiors for luxury cars might be done right here. An example of an individual craftsman who bridged the gap between the carriage and automobile was Lee Seaman who once outfitted horseless carriages with tops and celluloid curtains. He later worked on the popular sports cars such as the Speedster, Duryea and Winston. Seaman's company installed seat covers. An article about him in the Newark News in 1957 mentioned that he attended Morton Street School, and was an apprentice with the Quinby Company which made bodies for the Frascini and Losher cars with their wooden framed and hand carved bodies. By age 17, Seaman struck out on his own and soon began employing others. He was the first craftsman to make a touring car top which could be raised or lowered by one instead of two men. Some of his best known customers included Thomas A. Edison, Grover Cleveland and Newark politician Jim Nugent. Another example of bridging this gap in carriage to car manufacturing were local wheel makers. In 1933, The Newark Star reported on Wheels Incorporated at 234 Central Ave., which was involved in manufacturing wheels for automobiles. The financially most successful industry that developed in Newark for the auto trade was the Hyatt Roller Bearing Company. First located in Newark and later in Harrison, the firm eventually became a subsidiary of General Motors, providing most of the bearings for the nation's largest automobile maker. The product also was used in farm tractors, a variety of farming machinery, road building, oil well equipment, mining, mills and factories. Newark's traffic problems did not begin with the appearance of the auto, but they were soon became acute when piled atop already existing the trolley and horse-driven vehicles. One possible solution was proposed in 1912 with 'The Diamond on the Cross' plan. It suggested four new roads for the downtown business center, formed around the Four Corners. Each new thoroughfare was to be 100 feet wide From the Market Street railroad station to Broad Street and Central Avenues; from that point to Springfield Avenue near the courthouse; from there to Walnut and Broad Streets, south of City and back to the railroad station, completed the diamond. The plan on paper, was an ancestor to the now-familiar traffic circle and four-leaf clover, which in 1912 were some 16 years in New Jersey's future. The problem was that 21 trolley lines ran into the center of town, and 13 crossed or turned at Broad and Market streets. During rush hour more than 515 trolleys passed this point, and 900 vehicles, mostly horsedrawn carriages and wagons brought thousands of passengers to the center of town. The city was ready to proceed with the plan in 1912. It had been approved by the state legislature in 1914, but final approval lagged, and the council eventually backed down when the total costs became apparent. Again in 1924, the plan was revived but failed to gain sufficient support and so it finally died. In the 1930s, the old fashioned oil-lighted traffic lamps were slow in working. A semaphore system built at the traffic tower actually did little to relieve traffic congestion. In the 1940s, a controversy erupted over the slow-changing amber traffic lights. Opponents claimed drivers were always trying 'to beat the lights' and in fact, the light slowed the very traffic it was supposed to control, adding to the number of accidents. A new traffic plan in 1940 recommended the elimination of all left turns and called for closer police supervision during rush hours. In March 1942, the long-awaited parking meters went into operation. The Newark News reported in February 1946, that parking continued to be a serious problem throughout the city, and that the worst bottlenecks existed in the vicinity of Market Street and Springfield Avenue. Attempted truck deliveries to stores encouraged double parking, and this further inspired public double and triple parking. The solution seemed clear. More off- street parking was necessary. In 1947 the News reported that 'The long-heralded post-war traffic jam is here.' The end of crippling wartime shortages had brought out every person and vehicle in the country, creating 'wretched parking conditions which were one of Newark's major problems.' To resolve the situation, the newspaper advocated for additional parking meters for the one hour shopper, and that the all-day parker was monopolizing the good parking places. The report also was critical of city police for not enforcing rules. The News reported: 'More Manpower Key to Traffic Problems. Less Than Half as Many Men Now Assigned to Department Than in 1931.' Public Safety Director Keenan responded that there were simply not enough police to do the job. At that time, 169 officers were assigned to traffic, as opposed to 377 in a previous year. To add to the problem, merchants completely opposed a ban on parking along Broad and Market streets. And so the city struggled to find a solution to the vexing problem of 'where am I going to park next Monday morning.' Part of the answer could be found in the eventual construction of the Military Park Garage in the 1950s, the creation of numerous private parking lots in the 1960s, 1970s and 1980s, and the construction of massive parking buildings in the 1990s. The first Newark Auto Show was held in 1908 at Electric Park on South Orange Avenue. The show's chief officer was George Paddock, who was also president of the New Jersey Automobile Trade Association. Opening night was attended by Mayor Jacob Haussling and other local political notables, and the famed march king composer John Philip Sousa was present. The crowd of more than 3,000 was large enough to have difficulty in actually looking at the cars on display. But the show was considered a great success as 25 of Newark's 30 new car and accessory dealers took part. Sales topped $100,000 for a successful first-time event. Both exhibitors and attendees were very pleased. Newark also had many important car dealers. Howard Wiseman, archivist of the New Jersey Region, Antique Automobile Club of America, recently listed them at the time. Besides the fancy show rooms at Washington Park and near Branford Place, he mentioned specific agencies that included the Crow-Elkhard Co. at 228 Central Ave.; the Autocar Sales and Service Co., at 418 Washington St.; the Waring-Cole Co. which sold Daniels and Jordan cars at 28 Halsey St.; the Hudson Motor Co. at 961 Broad St.; James W. Mason, who sold the Peerless at 982 Broad St.; the North Jersey Motor Vehicles Co., which featured the National at 413 Central Ave.; Carl H. Paige Motors, which sold the Mitchell at 35 Halsey St.; the Mallon Motor Car Co., that sold the Packard at 1006 Broad St.; Pierre L. Smith Company, that sold the Marmon at 254 Central Ave.; and the Raemer Motor Car Co. at 495 Central Ave. Wiseman, a former employee of the Newark Public Library, is an old car collector, having owned a 1956 Packard Executive, a 1939 Graham and a 1936 Hupmobile. The Graham, which Wiseman still owns, is a rare car. Only a few were made annually. The company, Graham-Paige, merged into Kaiser-Frazer, which became part of Chrysler Corp. and today has joined with Mercedes Benz. Wiseman drives his antique car in local historical car parades and rallies. In the last few years, Newark's great old car dealerships have simply left or gone out of business. In 1955, DeCozen, largest Chrysler-Plymouth dealer in New Jersey, the same dealer who came here as a result of the 1924 Newark Auto Show, closed. As an independent auto merchant, he was credited with being the largest Chrysler dealer in the world. In 1981, Hagin and Koplin went out of business after 47 years. According to Harry Koplin, Newarkers simply weren't buying VWs. In 1990, Central Cadillac Co., once among the largest Cadillac dealers in the nation, permanently shut its doors at the close of the business day, due to declining sales, tight money and high operating costs. Sales had dropped from 2,700 to less than 500. But times change. In looking for a new car dealer these days, one has to take to the road along routes 46, 3 and 22 in search of a 'best friend,' the American automobile. For how can we get from point A to B, impress our friends and neighbors, or just enjoy the thrill of driving without a new car?